Here's a great excerpt from an1830's tome I recently purchased about men's fashion. Full of great new stuff. The Road to Elegance and Fashion. 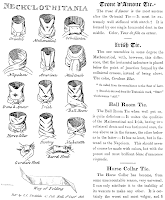 I shall now proceed to note and comment upon a portion of dress, in the selection and method of wearing which taste and neatness is pre-eminently to be distinguished; more particularly in full costume. First I shall treat of Stocks, which, though assuming a variety of forms, and shaped for the sake of perspicuity, I have distinguished only under their three general heads, the Royal George or Full Dress, the Plain Beau, and the Military. The origin of stock is very ancient, though for the last half century they have been worn almost exclusively by the Army, Navy, and Marines, until first revived into public notice by his late Majesty, in the year 1822, when they immediately became an universal fashion. Though at first viewed with a prejudiced and jealous eye by friends of the old school, after some opposition from the petits maitres tribe, they at length found their way into the opera and ballroom, and became a portion of full-dress costume. But this has only occurred since his Majesty was pleased to display one at Drury Lane theatre, composed of velvet and satin, from whence the present full-dress stock takes its name. Habit still, however, in some degree, reflects upon stocks for evening costume, and the adoption, though increasing, is by no means at present popular among the ton. I now proceed to describe three fashions I have classed them under. Or Full Dress. 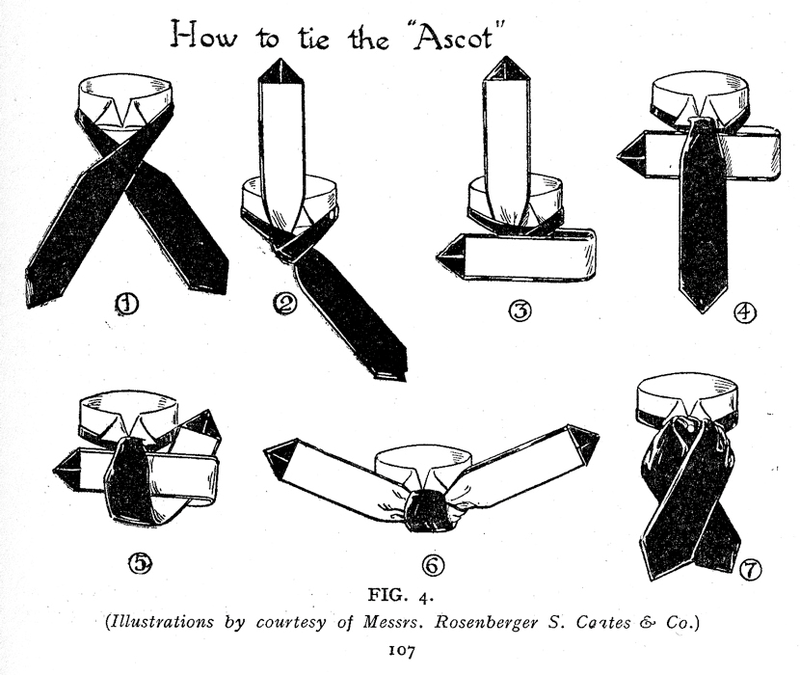 This stock, the shape of which is left in a great degree to the wearer's pleasure, is composed of the richest black Genoa velvet and satin, the latter which, sloping down each side of the velvet, terminates in the centre with a very handsome tie, representing a small gordian knot with short broad ends. From the beautiful and lively contrast, of the velvet and satin, this stock is peculiarly becoming to dark complexions, as nothing can afford a stronger relief than the deep sable of its exterior. His Majesty and his royal brothers were always remarkable for wearing them extremely high on the cheek, so that the sides came close under the ears, extending to the utmost verge of the chin. Though this certainly gives a very noble and fine effect to some countenances, the rage for it has passed away and is now deemed singular. 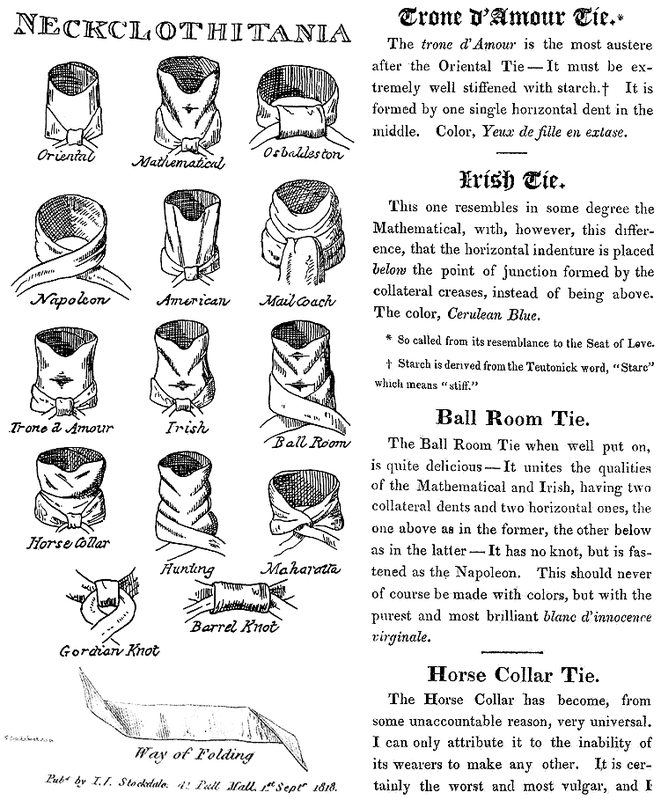 With regard to Neckcloths, it is first indispensably necessary to premise, that previous to putting into execution the fashions here developed, the utmost attention should be paid to their washing, bleaching, and starching; the latter of which must generally be used in such proportion as to stiffen the cloth to the consistence of fine writing-paper. 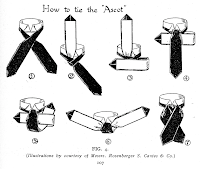 You may then confidently make your first folds as in the annexed plate; and then, with some slight practice and care, may execute the following ties at pleasure.